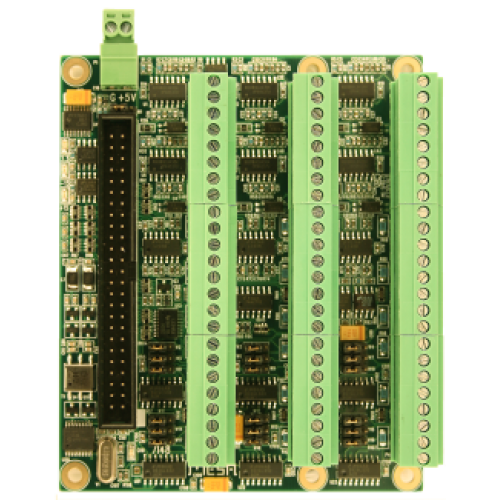 The 7I48 is a 6 axis analog servo interface intended for operation with MESA's Anything I/O cards in motion control applications. The 7I48 takes complementary PWM signals from the Anythng I/O card and converts them to +- 10V analog output voltages for direct connection to analog input servo amplifiers. The 7I48 has 5 pole filters on each analog channel to eliminate output ripple at PWM frequencies down to 24 KHz. The 7I48 also conditions the encoder input signals for TTL or RS-422 encoder inputs. The controller connection is a 50 pin header that matches the pinout of the Anything I/O cards. All analog and encoder I/O is terminated with pluggable 3.5 mm screw terminals (supplied).